MintMenu (which is a fork of Slab) is one of the best Linux main menu's I've seen. We already reviewed it HERE (click for a lot more info and screenshots). 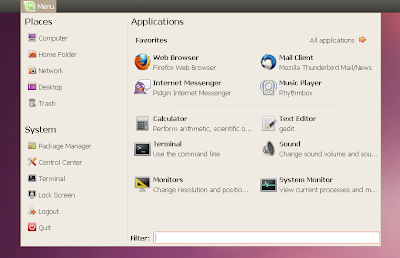 Once you install it, right click on a Gnome panel, select "Add to panel" and then search for and add "MintMenu". The package in the MintMenu PPA is the latest version which comes with the latest Linux Mint 9 Isadora. MintMenu is also available in the WebUpd8 PPA - a PPA where all the packages we will be publishing to different PPAs will be copied (except VLC - no more VLC in the WebUpd8 PPA).